A BP offshore oil platform suddenly shows signs of a potentially devastating leak. Bubbles form in the seawater. Alarms sound. Panicked oil workers flee the rig. That may sound like the moments that preceded last April's Deepwater Horizon explosion in the Gulf of Mexico, but it actually describes an event 19 months earlier, in the Caspian Sea waters of tiny Azerbaijan. There are uncanny echoes of the Azerbaijan incident in the Deepwater Horizon tragedy, including the likely cause  a faulty cement job. But there was one marked difference: While the Gulf explosion created an ongoing political firestorm, the Azerbaijan leak remained almost forgotten until last week, when another leak  this time of diplomatic cables, released by WikiLeaks  showed just how close BP had come to a major disaster in the Caspian. But the partnership with the Azeri state energy company SOCAR was strained to the limit one morning in Sept. 2008, when a blowout in a gas-injection well on BP's Central Azeri platform prompted the emergency evacuation of 212 workers, and shut down large parts of the offshore production in the Caspian's Azeri-Chirag-Guneshli (ACG) field. That accident deprived the Azerbaijan government of revenues of up to $50 million a day during the weeks when production plummeted, according to the leaked cables. "It is possible that BP Azerbaijan 'would never know' the cause of the gas leak," Ambassador Derse wrote to her bosses in Washington on Oct. 8, 2008, citing confidential talks with the American head of BP Azerbaijan, Bill Schrader. "BP is continuing to methodically investigate possible theories." A later cable says BP concluded that "a bad cement job" caused the leak. BP has not said which company was responsible for that cement work, and its 2008 annual report offered few details. The leak is mentioned on page 28 of the report, where it is stated only that production had resumed "following comprehensive investigation and recovery work." The cables, first published in London's Guardian, demonstrate the sharp contrast between the saturation coverage of the Gulf blowout, and the Azerbaijan leak that was barely covered in the local press. "Unless you were on the inside you didn't know how serious it was," says Edward Chow, senior fellow at the Center for Strategic and International Studies in Washington. "It hit the trade press, so if you were reading Platts [a specialist oil newsletter] you would have seen it." BP said in a statement published in the Guardian that the company "enjoys the continued support and goodwill of the government and the people of Azerbaijan," and that its discussions with the government are confidential. That loss seems trifling by comparison to the $40 billion or more in cleanup costs and legal liabilities that BP faced over the Gulf disaster, even before last week's Obama Administration decision to sue BP and eight other companies involved in Deepwater Horizon. And the revelations about the Caspian incident may have government lawyers picking over the details in search of a pattern of lax safety on BP platforms. In the Caspian leak, the gas did not ignite, and all the workers made it safely off the rig  a far happier outcome than in the Gulf. 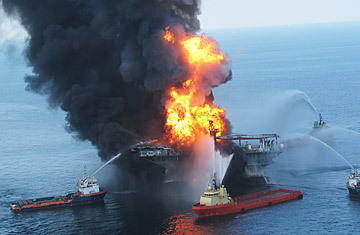 In what could be seen in retrospect as another portent of things to come, Ambassador Derse described the Azerbaijan government's annoyance over what they said was BP's secretiveness about the incident  a charge which would be repeated by President Barack Obama less than two years later, when he lashed out at BP for obfuscating over the Gulf blowout.